A melt-in-your-mouth treat that’s not too sweet! My family consumes many litres of maple syrup each year. We are really fortunate to live not far from Lanark County, the maple syrup capital of Ontario, so we have easy access to a steady supply of top-quality syrup. While it’s been a bit of a slow start this year to maple season in the Eastern Ontario region, things are now in full swing and I can’t wait to get out to visit a few local sugar bushes. In addition to being a favoured topping for pancakes and French toast, it’s also our go-to sweetener for such things as coffee, hot cocoa, porridge and granola. It’s versatile and way more nutritious than refined sugars – in fact, maple syrup is packed with antioxidants, vitamins and minerals, plus it has a lower score on the glycemic index. I love it on chicken wings, in this yummy snack mix, whipped with butter and even in cocktails! These cookies are a great way to celebrate maple syrup season; they’re as delicious as they are pretty. * superfine sugar is sometimes called fruit sugar. It is more finely granulated than ordinary white sugar, but not powdery like icing or confectioners’ sugar. You can purchase it (Bulk Barn is one source) or make your own by pulsing granulated sugar in a blender. In a bowl, beat the butter until fluffy. Beat in the sugar until light and fluffy. Sift together cornstarch and all-purpose flour then blend into butter mixture just until incorporated. Add vanilla and maple syrup and combine until just incorporated. The dough will be very soft. Remove from bowl and place on a sheet of plastic or beeswax food wrap. Shape into a disc about 1/2 inch (1.25 cm) thick) and wrap tightly. Chill in fridge for about an hour, or until firm. (You can chill longer if desired). When ready to bake, roll out very lightly floured disc of dough between two sheets of parchment paper and cut into desired shape. Note: if the dough gets too warm to lift cut shapes off parchment, place it on a baking tray and put in the freezer for about 5 minutes. 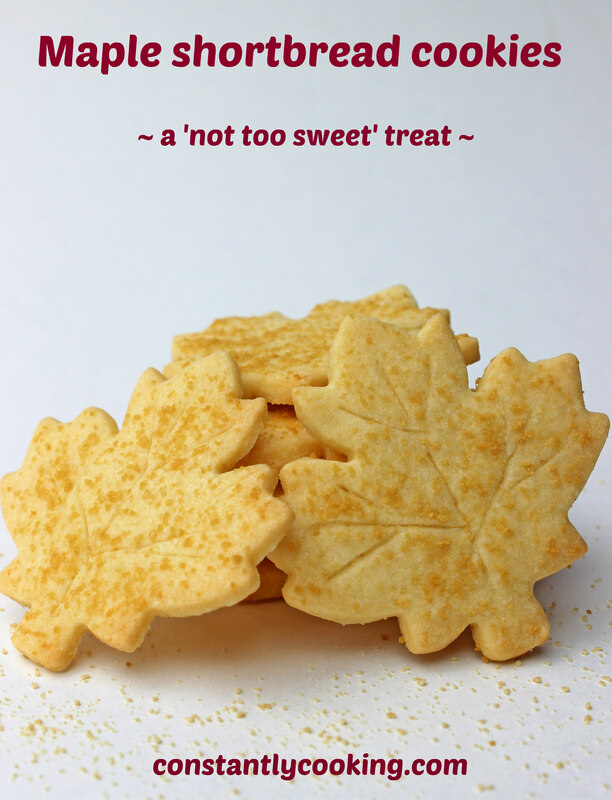 Place cookies on prepared baking sheet and sprinkle with a little of the maple sugar. With the tip of a sharp knife, lightly score lines to resemble veins in the top of each cookie. Bake in the preheated oven until edges are lightly golden, about 14 – 16 minutes. Cool on baking sheet for 10 minutes then transfer to wire racks to cool completely. Store in an airtight container for up to a week or freeze for longer storage. Makes about 2 dozen cookies depending on the size of your cookie cutter. 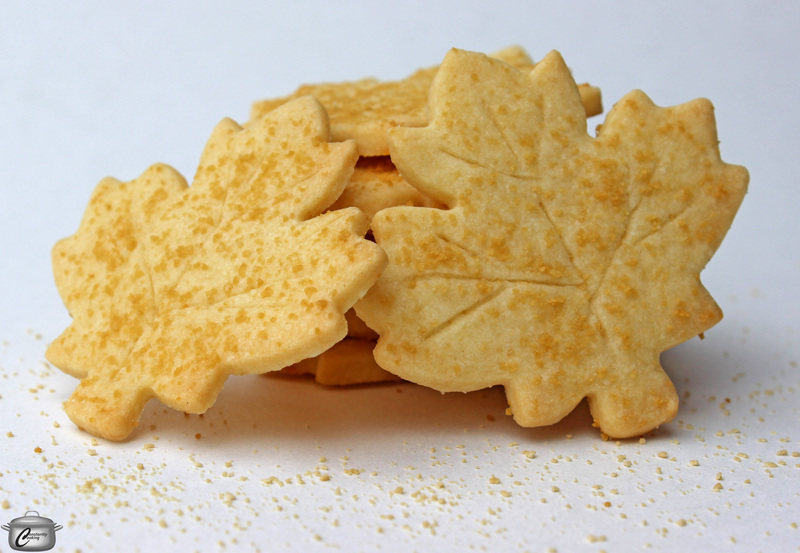 This entry was posted in baking and tagged baking with maple syrup, cookies, Lanark County, mad about maple, maple, maple sugar, maple syrup, Paula Roy, shortbread, shortbread cookies, what to make with maple syrup. Bookmark the permalink.